They are such funny weather predicting creatures, these ground hogs. They have names like woodchuck, land-beaver, and whistle-pig. Our regional prognosticator is name Punxsutawney Phil. He’s known as the “Seer of Seers,” the “Prognosticator of Prognosticators” and the “Most Photographed Pennsylvanian.” People in Pennsylvania dress up in top hats and tails and have this whole big event each year to see if we are going to have an early spring or late winter. Leave it to a rodent to let us know. Late Breaking News: Punxsutawney Phil did NOT see his shadow at Gobbler’s Knob today, Feb. 2, 2016, Groundhog Day, and so Spring is just around the corner. Funny weather predicting creatures. I like them. I used to have one that lived in the woods behind my previous house. He liked to stand on top of the hill and watch the world go by. 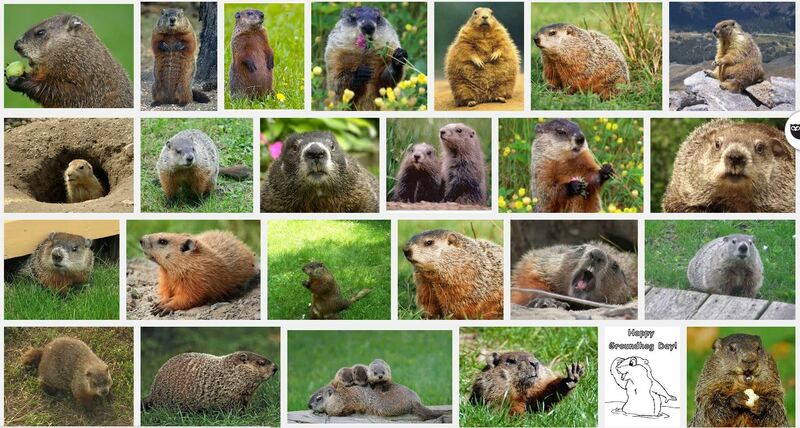 They have some interesting names: Land Beaver, Whistlepig, Woodchuck, Wood-shock, Groundpig, Whistler, Thickwood Badger, Canada Marmot, Monax, Moonack, Weenusk, and the Red Monk. The name “Thickwood Badger” was given in the Northwest to distinguish the animal from the Prairie Badger. Monax was an Native American name of the woodchuck, which meant “the digger.” Babies are called “Chucklings” (I love that!). These are a North American critter and I don’t believe you see them else where in the world.